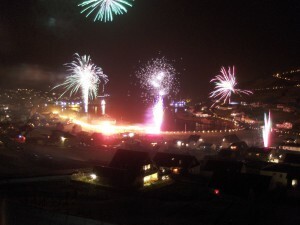 Other main events are the torch light procession, the firework and the bonfire that takes place on the spot called the “Triangle”. In the late 1960s the New Year’s Committee took over the Triangle. Originally the place used to be stone-paved ground for drying fish in the sun used by the local ship-owner thus being historical in itself. In connection with the New Year’s Festival 2000 the New Year’s Committee, in cooperation with the Council, improved the appearance of this place so that the Triangle obtained its present beauty. Simultaneously a statue was erected to memorise the New Year’s Festival of the village. Mr. Helgi Larsen made and donated the statue that was unveiled by Mr. Mogens Dahl, chairman and pioneer in the New Year’s Committee for a generation, on 31 December 1999. The Committee’s purpose with this initiative is to set a cairn or beacon in lasting memory of the customs, solidarity and ordinance that have always characterised the New Year’s Festival in Vágur.